George Will Becomes MSNBC Contributor - Joe.My.God. 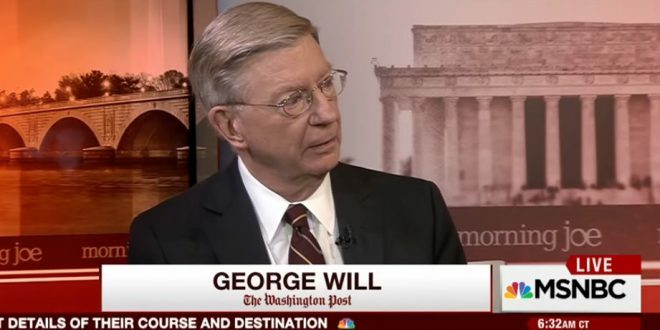 Washington Post columnist George Will has joined MSNBC as a contributor. Will, a Pulitzer Prize-winning columnist, was most recently a contributor at Fox News, though he became a free agent in January when Fox declined to renew his contract. Before joining Fox in 2013, he spent three decades as a contributor with ABC. A conservative columnist, Will broke from the Republican Party in June over candidate Donald Trump’s controversial comments about a judge with Mexican heritage, and Speaker of the House Paul Ryan’s ultimate endorsement of Trump. RELATED: Last week the HuffPost ran an interesting column about MSNBC’s seeming rightward turn.